Gloria Hughes (Mary Eaton) is a young woman who, like many young women, dreams of stardom. She hopes to move to New York City, where she would like to making it big in the Follies. While on the quest for stage fame, Gloria takes a job working in the sheet music department of a store. She makes ends meet belting out the latest hit songs, using her voice to convince shoppers to buy sheet music. Buddy Moore (Edward Crandall), an old friend from childhood who is in love with Gloria, accompanies her on piano. Danny Miller (Dan Healy), a vaudeville performer, is visiting the store one day and decides to ask Gloria to be his new partner. She, of course, sees this as the start of her dreams coming true. High-tailing it to New York City, she soon hits a few hurdles on her path to stardom, not the least of which is Danny’s interest in her as a romantic partner rather than a dance partner. Glorifying the American Girl is an early talkie, released in 1929 and directed by John Harkrider and Millard Webb. Cameo appearances are made by plenty of big names including Irving Berlin, Eddie Cantor, Rudy Vallee, Johnny Weissmuller, Adolph Zukor, Billie Burke and even Flo Ziegfeld himself. Glorifying the American Girl appears in Mill Creek’s 50 Classic Musicals set, and I’m impressed with the quality of their print considering the film’s age and copyright status. The sound is clear and the contrast is pretty good throughout most of the film. (Some of the brighter stage sequences are more washed out.) There is some film grain, but nothing overwhelming. Near the end there are a few more concerning blips, but overall the print is highly watchable. A more fully-restored, 96-minute print – complete with color – is only available by special appointment at the UCLA archives. In its first two thirds, Glorifying the American Girl is a light and fun watch. The story is a pretty standard one: small town girl seeks fame in the big city. Mishaps and little laughs ensue. Plenty more memorable films have been made on the subject, but the story here is still enjoyable to watch. Though the story breaks no new ground, I was incredibly impressed with the quality of the acting in this film. Early sound films can sometimes seem a bit stiff in terms of performance and dialogue delivery, but there are no such problems here. The performers in this film seem completely natural, probably because so many of them had stage experience. 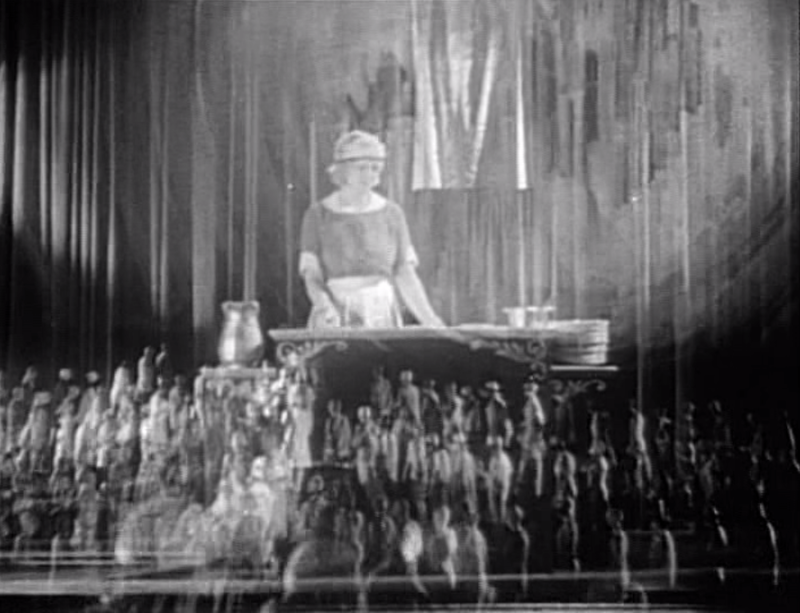 Along with the performances, cool photographic tricks in the opening draw the viewer into the film. There are plenty of cool double exposure sequences, showcasing the New York City pilgrimage so many stage-star hopefuls made before Gloria. There’s a lot to like about this film, but where Glorifying the American Girl really excels is in its final third, that previously-mentioned lengthy stage sequence. 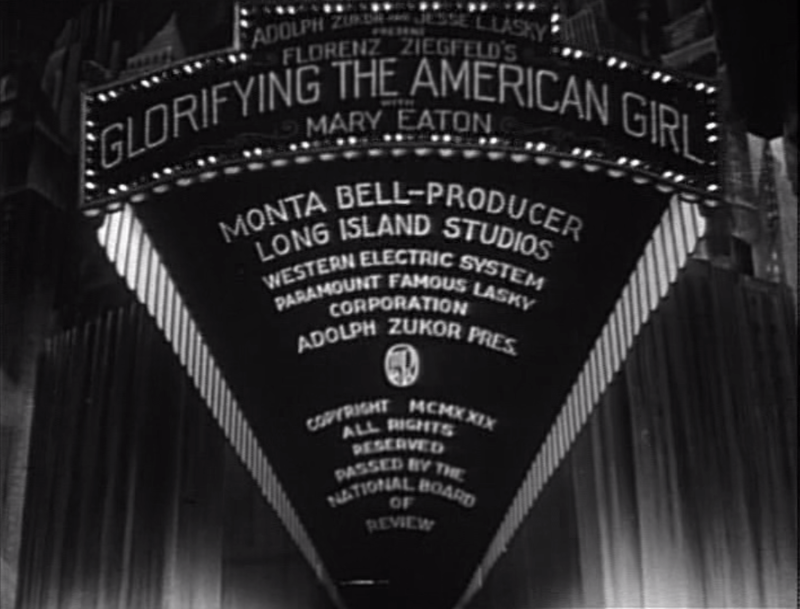 Though the extravagance is pared down slightly and a few interjections are made to follow Gloria’s experience with the show, this section of the film really makes the viewer feel as though they’re sitting in a theater watching a Ziegfeld show. The lovely music, the stunning costumes, the lavish stage decoration… if you’re interested in the Follies, this is a real treat. Time travel isn’t possible, so we can’t go back and see the shows first-hand. There are other films that recreate the Follies, but few seem as close to watching a real show as this one does.